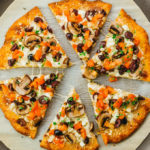 An easy recipe to make keto pizza crust that's grain free, also called fathead pizza. Includes ingredients for low carb Greek style pizza toppings. Position a rack in the center of the oven and preheat to 425 F. Prepare a baking sheet large enough for an 11-inch pizza, and line with parchment paper. In a heatproof mixing bowl, stir together cheese, almond flour, and salt. Add cream cheese. Microwave until the cheese is melted, about 1 1/2 minutes, pausing halfway to stir. After microwaving, stir until the mixture forms a smooth dough. Add the egg, stirring it in until absorbed and well-mixed. If easier, use your hands to knead when the dough is cool enough to handle. Place the dough on the parchment paper lined baking sheet. Cover with equally large plastic cling wrap. Use your hands to spread out the dough to form a thin and even 11-inch circle. Discard the plastic wrap. Dock the crust (poke holes with a fork) to prevent air bubbles. Bake the crust at 425 F for 10 to 12 minutes until golden brown. Remove the crust from the oven. Add toppings of your choice. If you use the suggested Greek toppings, first evenly distribute each of the cheeses, then distribute mushrooms, olives, garlic, tomato, and parsley, and then evenly drizzle olive oil on top. Return the pizza to the oven and bake for 5 to 10 minutes until mushrooms are tender but before the edges of the crust get too brown. For simpler toppings, bake for about 5 minutes until the cheese is melted. Each serving (1 slice or 1/6 of an 11-inch pizza) has 3.5g net carbs for only the crust and 6g net carbs for both the crust and Greek toppings.